Music was--and still is--a huge part of Mexican culture. This is a family band that has been providing us with great music for decades. Many of our elders will have fond memories when hearing and seeing this video. If you don’t like Tejano Music in the beginning…you will definitely like it in the END! As a Mexican National when I first came to Oregon in the early 50’s I could not relate to the culture. I did not speak English and the Spanish that I heard was different from the urban Guadalajara Spanish. For the next twenty years after my arrival, I would learn more about the local culture and evolve in an environment that was becoming Bilingual-Bicultural or one might also use the term Tex-Mex. As a young person those of us who were in their early 20’s enjoyed American Music i.e., Beach Boys, Beatles, Bob Dylan..in other words the Oldies from the 60’s were an every day event for most of us. 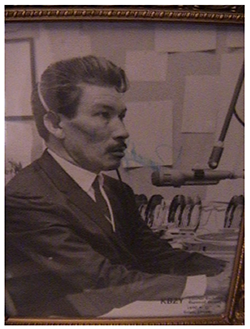 However, on weekends the new culture that began to set foot in the Valley, that is, Tex-Mex now included a weekly radio program directed by Reymundo Gomez. Below is a picture of Mr. Gomez at the controls. The Spanish radio programming now included a mix of Mexican music and música norteňa and Tex-Mex. To complement this new mix of music we had a few “conjuntos” that provided live entertainment for mostly Tejano families. The group that initiated the Tejano Music Movimiento was el conjunto de “Los Salinas” (no relation to the author of this short story)..they also had another name “Los Rebeldes.” Other conjuntos emerged to provide competition, variety and a bit of social rivalry not only between the conguntos but also between the communities outside of St. Paul, Oregon. The St. Paul Tejanos were almost exclusively from Asherton, Texas and the other Tejanos were from a place referred to as West-Tejas. Anyone who was not from the Tejano Culture would ease into the culture slowly. After all, most of what the Tejanos did was a bit different than non-Tejanos. A quick glance at the differences was things like: tortillas de harina instead of –de maiz-, the vernacular was also a bit different, attire was also unique and indicated point or origin. The Tejanos used a blend of Tejano Spanish and pronunciation with English words or SPANGLISH. The type of car and the way a car was adorned was also noticeable. I think it is safe to say that the Tejanos preferred a “Chevy” … and jeans or cakey trousers and black shoes with a good shine. For non Tejanos who were outnumbered by 10 to one, math became the determining factor in moving slowly onto the Tejano music experience. And then … as they old saying goes...”If you can’t beat them-join them.” I personally was in the “join-them category. I will also find out that no matter how hard I tried I could never be a Tejano. I missed the mark by a few years as many of my personal and cultural attributes had already been cultivated in my place of origen..Jalisco! NOTE Recently I found out something unique that is happening to “Tejanos” in our modern northwest Mejicano World. Most of us are familiar with the old phrase: “what goes around comes around”… Felipe Salinas (from Asherton, Texas) known as “La Pipa” as he is called and the fellow playing the “bajo”…part of the Salinas Bros., he said something that even I could not believe. When I asked him why his brothers could not get together to play as they did in the good-old-days … he replied that there was no demand for Tejano music and that even he “El Tejano” had to adjust to the modern times… he replied with indifference…”I am a pura BANDA man now.” I don’t dare to share my reply as it came out of my mouth without much control.. ”Ni modo Pipa…pero estamos perdiendo parte de nuestra cultura”…..I replied! I was more disappointed than he was. 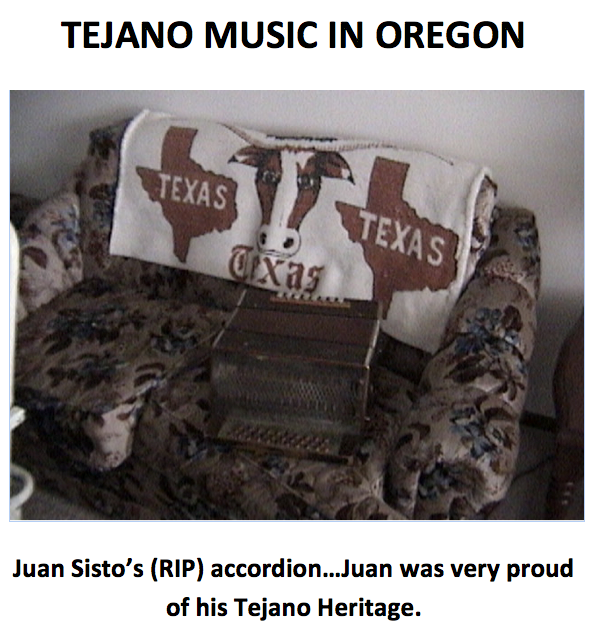 Even if it’s purely nostalgic for me personally, I was sad to hear the raw news from a musician who learned the art from Rosalio his father; the accordion was Rosalio’s favorite instrument-DOS TEJANOS! Which now leads me to my opening claim…Yes, Tejano music has a special magnet and it will draw you to it in the END; I am an example. If Tejano music and American Country Music are playing in a mano-a-mano situation one could see an interesting resemblance. It is fitting that we express our appreciation to a Musical Family who entertained the Migrant Families during a period of transition to Oregon Life. The Conjunto was unassuming and did their very best to provide a few corridos, valses, huapangos and occasionally a few English modern songs de rock-n-roll!! The group comprised of Don Rosalio (el jefe) - (RIP), Felipe, Mikes, Mere, Morro, Silvestre (RIP) and other individuals are in our Tejano Hall of Fame…principally our hearts! Antes que me pase a otra historia de nuestros Pioneros de Oregón. En Febrero de este año estuve en Carrizo y Asherton Texas celebrando el Santo de Ponchito Benavides 100 años de vida este hombre. En la fiesta estaban los Rancheritos de Asherton. Me preguntaron si “Los Salinas” todavía tocaban y les dije que no…No estaban contentos pero bien entienden que llega el momento que los músicos se retiran del FORO! Gravė una canción y la puede ver y escuchar. La tecnología a impactado del modo que nosotros escuchamos la música. Antes la música era un pasa tiempo especial ahora.. todo mundo trae su propia música y debido a la tecnología no la comparte con los demás puesto que traen audífonos. Cuando la Familia Salinas llego a St. Paul vivieron en el campo del Don Davidson. Esta reliquia de vivienda la tumbaron hace años, pero tuve la oportunidad de tomar una foto y con todo respeto y admiración aquí esta. 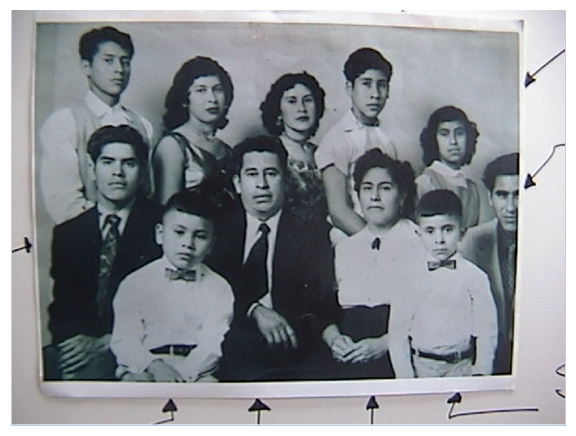 Rosalio y Dominga Salinas y sus 10 hijos e hijas. 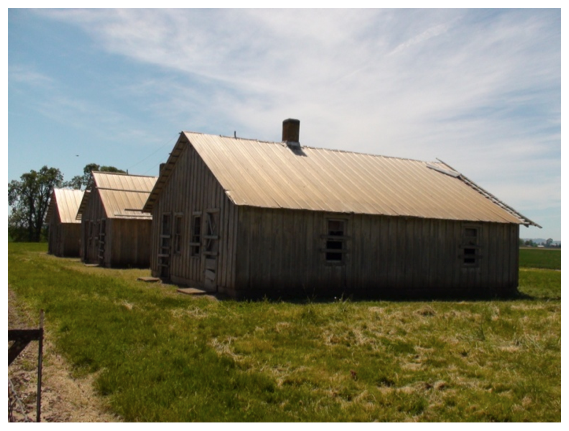 Originarios de Asherton-Cheto Texas. La mayoría permaneció en el Condado de Marion, Oregón. De la izquierda a la derecha los hijos/as: Mere, Felipe, Rosalio Jr., Dominga, Bene, Morro, Agapita, Maximiano (Mikes), y Silvestre. It is rare to see a family of twelve and I will not even think of el DICHO…más baratos por docena porque en un dicho originario en la comunidad “Anglo.” Para el migrante de Tejas tener una familia es de tener más alegría, mas vocas que alimentar pero también tener más manos para trabajar. Una familia grande valía más que una familia pequeña. Algo chistoso me ha pasado en los últimos anos. Para la gente que no me conoce y les digo como me llamo…de inmediato..me preguntan: oh tu eres parte de los músicos de St. Paul y les contesto “NO…soy de la familia pequeña y de los que no tocan o cantan. Y tampoco so “Tejano” y con una pausa les digo “Yo soy un Tejano-want-ta-be! !